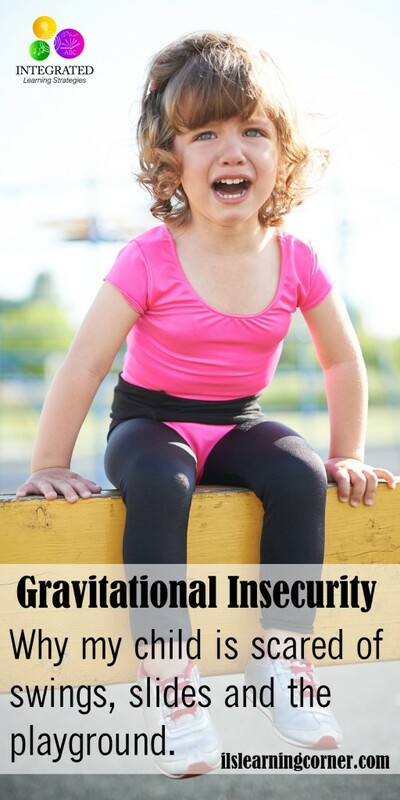 This article provides helpful information about gravitational insecurity and how it affects your child’s learning in the classroom. Affiliate links are included for your convenience. Abby waits in line with her classmates to get a drink of water. She is lightly touched on her back by the person behind her as she waits for her turn. In anger, she reacts by yelling and turns around to push the kids behind her. Her reaction more closely resembles a person that was threatened, not just touched. However, in Abby’s world, that simple touch from outside stimuli was threatening to her, which triggered a response of fight-or-flight. In another example, John’s uncle comes to visit. When he sees John, he immediately picks him up off the ground, spins him in circles and even dips him backward so his head is almost toward the ground. It’s playful fun for many children, and is only a warm welcome from his uncle, but for John, he is immediately terrified and screams or cries to be put down. What caused John’s strong reaction? In Abby’s situation, she had an over-reaction to a stimulus (touch) that sent her into full fight-or-flight mode. She has hypersensitivities to sensations that most children and adults generally tune out or don’t notice, which is most commonly known as sensory defensiveness. In John’s case, not only is he also hypersensitive to his uncle’s embrace, he struggles with gravitational insecurity. He was terrified the moment his feet left the ground and was fearful of not maintaining an upright position when his uncle dipped him backward. Children who experience both sensory defensiveness and gravitational insecurity have many fears of ordinary movement and don’t like their feet off the ground or being upside down. It is typically a sign that your child has an over-developed vestibular system that creates varying levels of stress that mimics, amplifies or results in several psychiatric conditions. In many cases, overstimulation from external stimuli can be caused by smell, touch, or even the wrong movement (swinging, sliding, walking down stairs, thrown in the air). The child usually reacts with negative emotions and behaviors. These kids are not just sensitive to the stimulus, they are fearful, bothered by its presence and are often distracted at home and in the classroom. There is a specific type of sensory defensiveness in a child that deals with the vestibular sense. This form of sensory averting behavior is called gravitational insecurity. Typically, a child with gravitational insecurity responds to movement and motion with an extreme emotional response. 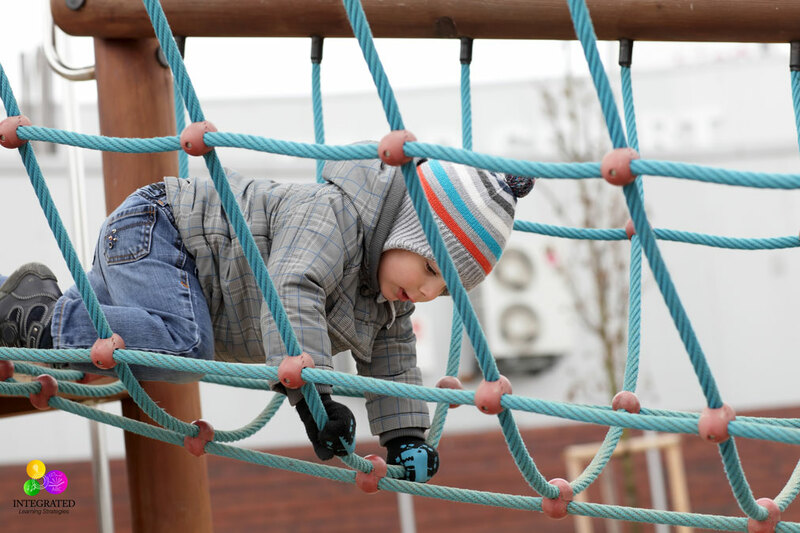 Most children enjoy jumping, swinging or climbing up a rock wall at the playground. However, a child with gravitational insecurity feels vulnerable whenever their feet leave the ground. The sense that you are secure on the earth relies on your child having a well-functioning vestibular system. When this sense is functioning properly, it is constantly feeding the Central Nervous System (CNS) information about balance and movement. When the vestibular system is not functioning properly, problems like gravitational insecurity can manifest itself in your child. We often see this in our students during our evaluations. They are terrified to get on the swings or use the scooter board because it takes their feet off the ground or puts their head in a downward position. It is not always known what causes sensory defensiveness. However, from studies and research, a child could be affected by a traumatic birth experience, head injuries, it may be genetic or hereditary, or it could be caused by environmental factors. What we do know is sensory defensiveness indicates a low neurological threshold and can affect your child’s vestibular, proprioception, visual and motor planning. What this means is that it takes very little stimulus to trigger a reaction in your child’s brain. It scrambles sensory information, causing them to become oversensitive to certain things within their environment. This may be why your child often avoids or is fearful of trying new activities on the playground, at school or at recess. Their vestibular system has so much sensory overload it creates gravitational insecurity within your child so they don’t want to experience some of the fun activities other children do. In turn, this affects your child’s development of gross and fine motor skills used as learning tools within the classroom. Just like a ripple effect, your child’s sensory, vestibular, proprioception and visual systems all build on each other to create opportunities for higher learning in school. The Wilbarger Approach to Sensory Defensiveness, also known as the “brushing technique,” suggests that sensory defensiveness is what happens when there is a disconnection in the CNS as it evaluates sensory information. A child that struggles with gravitational insecurity is fearful and anxious about normal movement. They are uncomfortable in a position that is not upright and anxiety sets in when their feet are off the ground. There is usually an irrational fear of heights that accompanies their movement around the house and within their environment. When a child has gravitational insecurity or other types of sensory dysfunctions, they can struggle in an academic environment. Because the vestibular system responds to body movement through space and change in head position, it automatically coordinates eye movements with the head and the body. Knowing this, a well-functioning vestibular system must be working for a student to look up at the chalkboard and back down to the paper without constantly losing their place. It is also important for tracking words on a page, processing the information they read, and prevents kids from writing their letters backward. If a child struggles with gravitational insecurity, they may have difficulty keeping their body upright and good posture at their desk may take a great deal of energy for their brain, the CNS and their muscles and joints (proprioception). If the vestibular system is not functioning properly, your child’s energy is lost when they try to stay balanced and coordinated. When this happens, your child no longer has the energy for higher learning concepts that begin in their cerebral cortex of the brain. This part of the brain is responsible for problem solving, expressive and receptive language, critical thinking, reasoning, and short-term and longer-term memory. Without gravitational security, a strong vestibular system and motor planning skills, your child is so distracted to keep their body and their brain calm, they can’t function at higher levels within the classroom. If your child experiences these problems, they may feel like many of the tasks given to them by the teacher are too difficult and they don’t understand why. Your child may also avoid certain tasks or activities that embarrass them and they may seem unmotivated and disengaged in the classroom. The constant pull of gravity that most of us take for granted, is the very thing that is a threat to a child with a gravitational insecurity. A slight movement may feel like they are being thrown into space, which is why he or she does not feel in control of their own body and its movement. Because each child is different, gravitational insecurity may have varying degrees on how severe it is in your child. 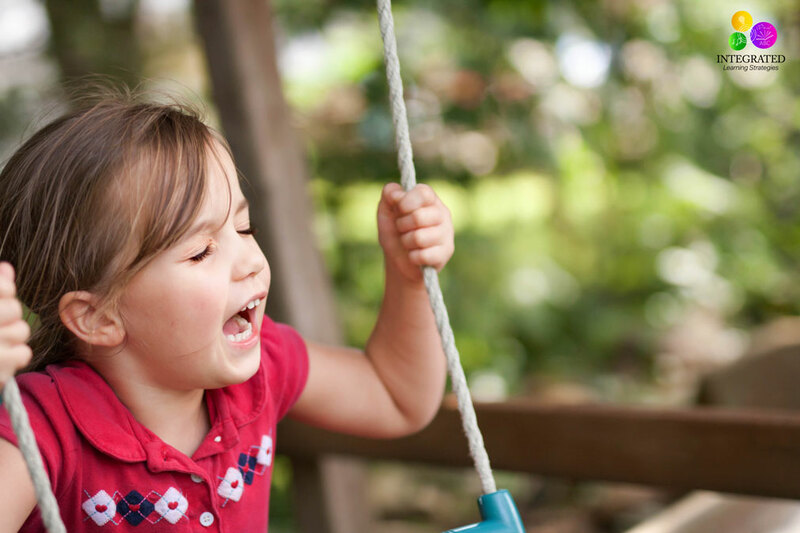 Sensory integration activities and baby steps toward exercises that incorporate gravitational security (swinging, climbing, twirling, and sliding) are often used to help improve your child’s dislike for certain types movement and sensory defensiveness.